Dec. 13, 2011: Surprising but true: Every day, on average, more than 40 tons of meteoroids strike our planet. Most are tiny specks of comet dust that disintegrate harmlessly high up in Earth's atmosphere, producing a slow drizzle of meteors in the night sky. Bigger chunks of asteroid and comet debris yield dozens of nightly fireballs around the globe. Some are large enough to pepper the ground with actual meteorites. With so much "stuff" zeroing in on our planet, NASA could use some help keeping track of it all. Enter the Meteor Counter--a new iPhone app designed to harness the power of citizen scientists to keep track of meteoroids. "Using our app, people from all walks of life can contribute to authentic NASA research," says Bill Cooke of NASA's Meteoroid Environment Office, which sponsored the project. "The data will help us discover new meteor showers, pinpoint comet debris streams, and map the distribution of meteoroids around Earth's orbit." 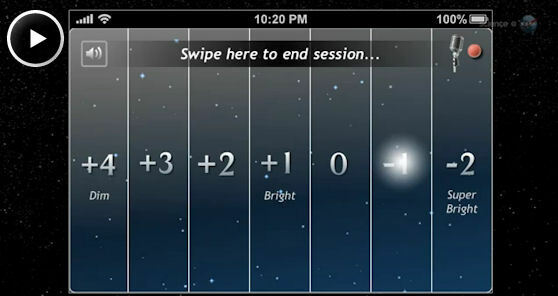 Whenever you go outside for a bit of stargazing, take your iPhone, iPad or iPod Touch with you, advises Cooke. Start the Meteor Counter, lie down in a safe dark place, and be alert for shooting stars. The Meteor Counter operates using an intuitive "piano key" interface. Every time you see a meteor, simply tap the key corresponding to its brightness. Keys on the left correspond to dim meteors—barely visible to the naked eye; keys on the right denote jaw-dropping fireballs. With each keytap, the Meteor Counter records critical data such as the time you saw the meteor, the meteor’s magnitude, and your location. You can even turn on an optional voice recorder to capture your own description of events. Experts could comment on the trajectory and radiant of the meteor, while novices might prefer to simply shout out--"wow!" Afterward, these data are automatically uploaded to NASA researchers for analysis. The Meteor Counter is designed for all kinds of observers, ranging from experts with experience in science-grade meteor observations to first-time sky watchers who might never have seen a meteor before. The Meteor Counter also acts as a meteor shower alert system. When a known shower is in the offing, the app pops up a reminder for observers. A news feed and events calendar is routinely updated by professional scientists to keep users informed of the latest meteor happenings. Cooke encourages citizen scientists everywhere to try it out. "The app is available free of charge in Apple’s app store," he says. "Just search for Meteor Counter, and let the observing begin."